Huis ten Bosch (Dutch: Paleis Huis ten Bosch, pronounced [paːˈlɛis ˌɦœys tɛm ˈbɔs]; English: "House in the Woods palace") is a royal palace in The Hague in the Netherlands. It is one of three official residences of the Dutch Royal Family; the two others are the Noordeinde Palace in The Hague and the Royal Palace in Amsterdam. Huis ten Bosch was the home of former Queen Beatrix of the Netherlands from 1981 to 2014; the current King Willem-Alexander and his family moved in on 13 January 2019. A replica of the palace was built in Sasebo, Japan, in a theme park bearing the same name. Construction of Huis ten Bosch began on 2 September 1645, under the direction of Bartholomeus Drijffhout, and to a design by Pieter Post and Jacob van Campen. It was commissioned by Amalia of Solms-Braunfels, the wife of stadtholder Frederick Henry, on a parcel of land granted to her by the States General (Loonstra 1983, Slothouwer 1945). The first stone was laid by Elizabeth of Bohemia. After her husband's death in 1647, Amalia dedicated the palace to him. Led by the architect-painters Jacob van Campen and Pieter Post, other major artists of the day such as Gerard van Honthorst, Jacob Jordaens, Thomas Willeboirts Bosschaert, Theodoor van Thulden, Caesar van Everdingen, Salomon de Bray, Pieter Soutman, Gonzales Coques, Pieter de Grebber, Adriaen Hanneman and Jan Lievens filled the Oranjezaal ("Orange Hall" ) with paintings glorifying the late prince. Between 1734 and 1737 the architect Daniel Marot added two wings to the palace, including a new dining room. Over the next century and a half, the palace would change possession from the Nassau family, the king of Prussia, and many stadtholders until the Batavian Revolution in 1795. The government of the newly created Batavian Republic gave the palace to the Batavian (Dutch) people who still own it to this day. The National Art Gallery, predecessor of the Rijksmuseum, was housed in the building from 1800 to 1805. Napoleon Bonaparte's brother, Louis, king of Holland, briefly lived in the palace between 1805 and 1807. 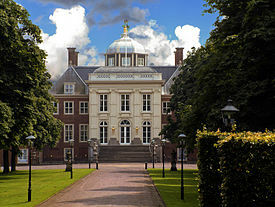 When William Frederick, Prince of Orange-Nassau, the only surviving son of the last stadtholder, was proclaimed King of the Netherlands as William I in 1815, he made Huis ten Bosch Palace one of his official residences. It became a favourite location for many members of the Royal Family. In 1899 the palace was the site of several meetings of the First International Peace Conference at The Hague. During World War I it became the primary residence of Queen Wilhelmina. ^ In isolation, ten is pronounced [tɛn]. ^ Stenvert, R. et al. (2004). Monumenten in Nederland: Zuid-Holland, p. 227–228. Zwolle: Waanders Uitgevers. ISBN 90-400-9034-3.